Looking for the best non-toxic toys and toy brands? 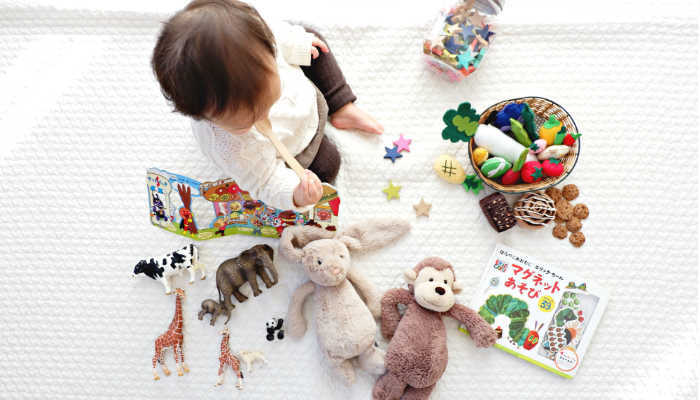 Whether you’re looking for non-toxic infant toys or non-toxic toys for toddlers and beyond, this guide will tell you everything you need to know in order to make safer choices for your little one (for play mats see here). Whilst we all want the best start in life for our kids in term of toys that entertain, stimulate and nurture our child’s growth and development, what many parents don’t always realise is that many of today’s everyday toys and bath toys (especially those made in China) still often contain harmful chemicals. I was born in the 70s (how old! ), when many toys weren’t even tested and a recent article in the BBC showed how many toys from this era contained high concentrations of hazardous elements such as barium, bromine, cadmium, chromium, lead and selenium. These chemicals can prove toxic if children are exposed to them at a low level over an extended period of time. The good news though (apart from the fact I’m still here) is that there’s much more information available today, making it much easier to find eco friendly, non-toxic toys for your child. It’s easy to get a bit hysterical over toxins, (I know because I’m a bit of a born worrier! ), so it’s important to remember how amazing our body is and that it’s designed to detoxify on a daily basis. It’s important to remember as well, that it’s actually a good thing to be exposed to dirt and toxins to some extent – it’s what helps us to build healthy immune systems. What’s changed, however, is the unprecedented level of man made chemicals and toxins we’re now exposed to. The planet is saturated with them like never before and our bodies are bombarded with them every day, via food and water, air, clothing, cosmetics, cleaning products and a host of other everyday things. In 2017, scientists even categorised the earth as a ‘toxic planet‘. Medical science is also increasingly linking conditions such as obesity, cancer, heart disease, as well as autism and ADHD to the growing volume of toxic substances humans are exposed to daily. For me, this is why it makes sense to take precautions to limit these toxins where we can, especially in babies and children, whose immune systems and vital organs are still maturing and often less able to fight of harmful substances. Plus of course, babies and toddlers are prone to exploring on the floor, where they put everything in their mouth, making ingestion of chemicals more likely. 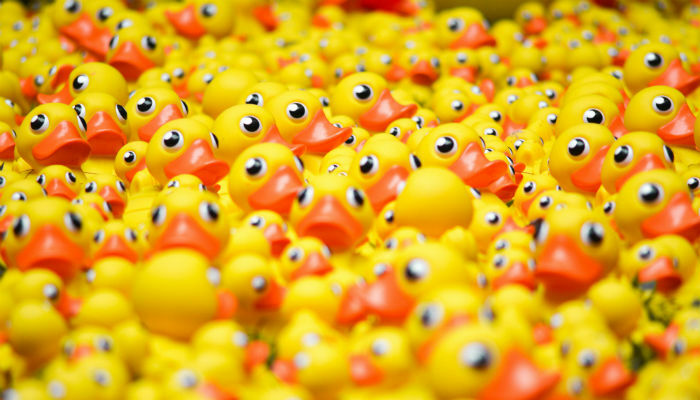 So what does the law say about non-toxic toys? In the US the CPSC has regulations in place for ensuring toy safety and this includes a section on lead and heavy metals. In late 2017, the Consumer Product Safety Commission (CPSC) also voted to issue a final rule prohibiting children’s toys and child care articles from containing more than 0.1 percent of certain phthalate chemicals. Over in the EU toys are required to have a CE mark, which shows that a toy satisfies a set of essential safety requirements. However, the CE mark is more of a trade symbol, and whilst it’s something that enforcement authorities such as trading standards will look for, it’s not really meant for consumers. If an imported toy in the EU doesn’t have a CE Mark though, it’s best avoided. These regulations suggest that, in theory, things should be getting better, but how these standards are enforced or checked is sometimes unclear, whilst documentaries such as Unacceptable Levels, suggest there are still many harmful ingredients in children’s toys. Be aware as well that some imported ‘toys’ and novelties often aren’t covered by specific toy legislation. For example, according to www.toysadvice.co.uk, imported Christmas decorations and some dolls, puzzles and children’s jewellery don’t have the same level of protection from toy safety legislation within the UK. Now let’s look at some of the key things to avoid and look out for when shopping for non-toxic toy brands. BPA/PVC – Look to avoid plastic toys made out of BPA and PVC which often include phthalates, a suspected endocrine disruptor. Soft plastic toys such as bath toys, plastic dolls and inflatable toys are often the big offenders here. Plastic is also categorised with a number between 1 and 7 depending on the types of resins used in the plastic. Those classified as #1, #3, #6 and #7 are generally considered to be the worst offenders. Toxic dyes, finishes and glues – Also look to avoid toys with potentially toxic paints, dyes finishes or glues. Some paint still contains lead and glues may contain formaldehyde, a common VOC. For example, toys made from manufactured wood such as MDF and Ply-wood are commonly bonded using toxic glues and other adhesive materials, so are best avoided where possible. ‘Toys’ such as metal jewellery and play make up (such as that stinky nail varnish you get in many girls comics) are also best avoided, as they’re often not subject to any safety regulations and may contain lead or other heavy metals. Flame retardants – Also be aware of toys that may contain flame retardants. Unfortunately, it’s not always easy to tell when chemicals in flame retardants are present, but as a guide soft toys and toys containing foam may contain flame retardants. The product details should tell you. Second hand toys – Where practical, also look to limit hand me downs or second hand toys, especially if they are pre 90s, as these are less likely to conform to current safety standards. Recent research in the UK actually discovered high concentrations of hazardous elements including antimony, barium, bromine, cadmium, chromium, lead and selenium in a range of toys they tested from nurseries, homes and thrift stores across the SW of England. Toys made in China – I’ve seen many sites condemn all toys made in China with the suggestion you avoid them completely. Whilst it’s true China is notorious for using cheap materials, often with toxic finishes and very little regulation, just because a toy is made outside of China, doesn’t automatically make it a safer option. For me the real question is whether a toy company has made an authentic and ethical commitment to ensuring high quality or not. The recommended non-toxic toy companies I’be listed below should help you with that. It’s easy to say avoid plastic completely, because of environmental issues and suspected health problems associated with chemicals in plastic, such as BPA, phthalates and PVC. However, this isn’t always practical. Plus if you’re on a budget, making the switch to wooden toys is generally more expensive. So if you do consider plastic, be wary of products labelled solely as ‘BPA free’ – BPA free has become a popular selling point for pretty much any plastic toy on Amazon to shout about, but recent research suggests BPA alternatives may not be any safer. For safer plastic options, look specifically for toys labelled as BPA, Phthalates and PVC free. If the product details lists it, toys made from plastics #2, 4, and 5 are also generally considered safer choices. 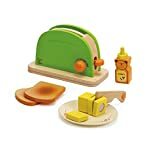 A good example is the Green Toys Baby Toy Starter Set on Amazon. It’s listed as ‘no BPA, phthalates, PVC, or external paints or coatings’. It’s also listed as made from #2 plastic. This is the type of labelling to look out for. Whilst wooden toys are a bit pricier, they do nevertheless make make a great choice (non-toxic wooden toy brands listed below). Not all wooden toys are made the same though. 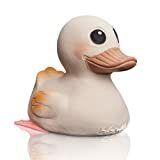 So look for toys made in unfinished natural wood (i.e not manufactured wood such as MDF or plywood), or with non-toxic clear finishes (look specifically for beeswax or food-grade oil finishes, such as linseed) or solvent-free, water or plant based paints. Also look for toys constructed from non-toxic (non-formaldehyde-based) glues – if the product uses a non-toxic glue, it will likely say so on the product details – but you can always ask the manufacturer if unsure. Ok, let’s look at some of the best non-toxic toy brands out there. To hopefully make things easier, I’ve separated the brands into companies that specifically make non-toxic wooden toys and ‘other’ brands, which use materials such as organic cotton and BPA, PVC & phthalate free plastic. Whilst non-toxic wooden toys are generally a little more expensive, they make a wonderful alternative to plastic. Word is both natural and very tactile, making it great for little exploring hands. It also inspires all the senses. 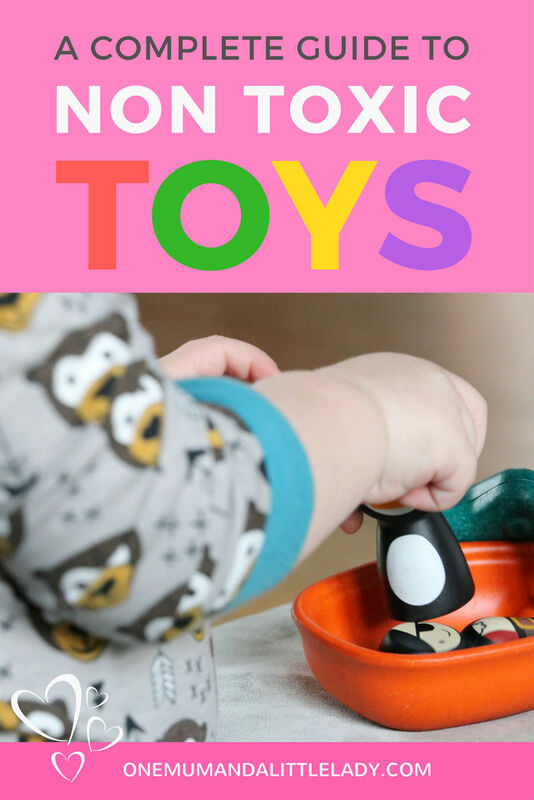 Here are the best toys brands I’ve found that produce non-toxic wooden blocks and toys. I love Plan Toys. They use sustainable materials as well as sustainable manufacturing processes, plus their toys are made with a child’s development in mind. You’ll find an extensive range of fun and educational toys for babies up to 4+ years. Toys are made in Thailand. Materials Used: Wood from natural rubber wood trees, which have no fertiliser added to the soil three years prior to cutting the trees down, in conjunction with their trademarked PlanWood, another high quality, safe and sustainable material. Glues used are non formaldehyde and dyes are water based. They also use recycled paper and soy ink for printed materials. Camden Rose make some beautiful wooden non-toxic toys, plus they have a great ethos. Materials Used: Toys are handcrafted locally in the Mid West of the US, from hardwood trees, such as cherry, maple and walnut, known for their durability and beautiful grain. Toys are polished with a blend of beeswax and USDA certified organic Jojoba oil or food-grade mineral oil. Glues used are formaldehyde-free. Camden Rose also produce a range of soft toys made from wool, silk and cotton. Maple Park have been making eco-friendly, non-toxic educational wooden toys and games, since 1979, at their shop in Vermont, USA. 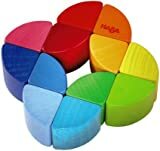 Often known for their NameTrains, Maple Park also make a lovely range of non-toxic baby and toddler toys, as well as a range of wooden board games. Nearly all the toys are made locally in Vermont, USA. Materials Used: New England Maple is used to make the wooden toys. A number of finishes are used and depending on the toy, include dye stains, lacquer, natural oil, teak oil, urethane or whey. The lacquer used is nitrocellulose lacquer, which is petroleum based and urethane is usually oil based, so choose a non lacquered or urethane finished toy if this is a concern for you. Maple Park are fully transparent with all materials used, so check product details or ask direct if unsure. Maple Park also offer a Schoolhouse Naturals line, which has no finishes at all. Where used, paints are non-toxic. 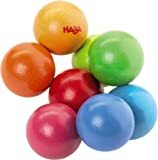 HABA is a fantastic German company who have been producing wooden toys for over 70 years. They’ve won loads of awards and their toys have a child’s development firmly at heart. Their toys are generally non gender specify too, which I like. 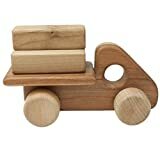 Materials Used: Beech and maple wood is used in the wooden toys and the wood is PEFC certified. This means all the wooden toys manufactured in Germany are made from reforested timbers. Non-toxic, solvent free, water based lacquers are used instead of paints. 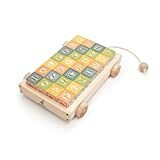 If you’re shopping for non-toxic wooden blocks, Uncle Goose arguably make the best wooden alphabet blocks on the planet (which incidentally come in 23 languages, including Braille). The blocks are handcrafted in the USA with little learners and explorers in mind and I really wish I’d known about them when I had my Little Lady! They are beautifully designed and made to last. 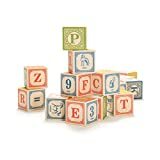 Wooden blocks are also one of the most beneficial toys you can get for your little one’s development. Materials Used: Fast-growing sustainable Michigan basswood. Non-toxic, child-safe inks. Grimms Spiel and Holz are another German manufacturer, again with a great reputation for producing natural and sustainable wooden toys. 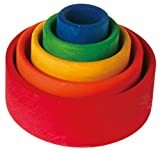 They make some great stacking toys and puzzles, which are often uniquely shaped and come in vibrant, non-toxic, colours, making them a great sensory experience for babies and little children. The toys are more expensive than some and possibly not the best choice if you live in the US, since the toys are harder to source and generally a lot more expensive on Amazon. Toys are made in Germany or Europe. Materials Used: Alder, lime, beech and maple wood sourced from sustainably managed forests in Europe. Colours and wood oil finishes are non-toxic. 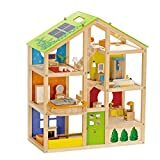 Hape are the largest producer of wooden toys and the wooden Hape wooden doll’s house is an absolute gem. I really like the unique design of Hape toys, plus they have a strong sustainable ethos behind their production methods and design toys to inspire learning and exploration. Toys are made in China. 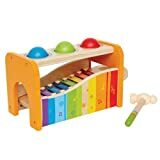 Best sellers include the Dolls House and Pound & Tap Bench With Xylophone and if you don’t mind noise (I mean ‘music’! ), the Mighty Mini Band Wooden Percussion Instrument is pretty cool! Materials Used: Wood from sustainable forests, renewable bamboo where possible. Paints and finishes are non-toxic, water based and solvent free. The recipient of lots of toy awards Wonderworld make some nice sensory stacking toys and blocks, as well as fun wooden vehicles. Again, they have a child’s sensory and fine motor skills development at heart with their toy design. Toys are made in Thailand. Materials Used: Renewable rubber wood that no longer produces latex. Wonderworld also plants 1 tree for each tree used in their toys in additional to 1 rubber tree already replanted by farmer. Non-toxic paints, dyes, lacquers and formaldehyde free glue. No specific details seem to be available on their website as to what lacquers are used. Let’s face it, plastic is everywhere but Green Toys have done everything they can to make it safer for kids. They’ve got a great eco friendly ethos and their toys are a hit with parents. I’m a big fan of this brand and the toys are really fun – from the best selling ferry boat to this colourful tea set. 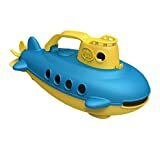 Their award winning submarine makes a great choice for non-toxic bath toys too, if you want to bin those PVC rubber ducks. Toys are made in the USA. Materials Used: 100% recycled plastic from milk jugs (HDPE number 2 plastic, widely considered safe). According to the Green Toys website they’ve recycled over 53,445,500 milk jugs! BPA, Phthalates and PVC free. Under The Nile make organic cotton soft toys, geared towards babies and smaller kids. 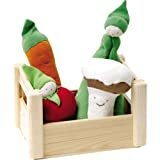 Their fruit and veggie soft toys are a best sellers. They’ve got a strong ethical ethos and guarantee good working conditions for staff in their Egyptian factory, which is located next to the Biodynamic farm where their cotton is grown. Toys are made in Egypt. Materials Used: 100% GOTS certified, organic Egyptian cotton. Stuffing is also organic cotton (rather than the more commonly used polyester). According to the website FAQs, dyes are low impact, metal free and don’t contain harmful chemicals such as AZO agents, flame retardants or PVC. Non formaldehyde based finishes are used and snaps are made of nickel-free copper, in line with OEKO-TEX standard 100. No bleach is used to whiten fabric, although a natural whitening process using oxygen is sometimes used to ensure colour continuity. Apple Park was founded my Mum, Angie Ting, who set out to create a of eco-friendly products for babies and small children. Toys are designed with babies and toddlers in mind and the adorable Farm Buddies are a best seller. Materials Used: Organic, GOTS certified, cotton. Stuffing is a mix of organic cotton and sustainable, hypoallergenic, anti-bacterial corn fibre. Dyes are low impact and AZO free in compliance with GOTS requirements. The FAQ page states no flame retardants are used in the products. Coatings on wooden teething rings are water based and non-toxic. Meet Sophie La Girafe (if you haven’t already!). She’s the go to non-toxic teething toy for most Mums and Vulli have been making her since 1961. If you’re not one to tow the teething toys line though, you can try FanFan the Fawn! 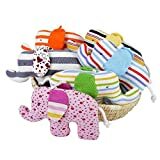 Vulli also produce a range of other non-toxic rubber toys (mainly teethers, rattles or chewable toys) suitable for babies and early learners. Toys are mostly made in France. Materials Used: 100% natural rubber, sourced from Malaysia Hevea trees. Natural rubber (not synthetic rubber, which is oil and petroleum based) is considered to be one of the safest materials you can use for baby products. It has far fewer VOCs, plus it’s durable and naturally antibacterial. It’s also considered naturally biodegradable. Paint is food based, which fades over time. 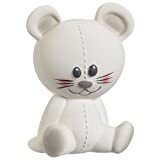 Hevea Planet are a Danish company who, like Vulli, produce a range of natural rubber baby toys. They specialise in non-toxic bath toys, pacifiers and teethers and create their products with a one-piece design, so there are no holes, cracks or joints for bacteria to hide in. Products are made in Malaysia. Materials Used: 100% natural rubber from Malaysia. Colours in the Kawan bath toy are natural food based pigments from vegetables and plants and may fade over time. Whilst it’s too much to explore in this particular guide, Etsy is also worth exploring for non-toxic, eco friendly toys. There are some talented people out there with a great ethos with regards to producing natural toys and kid’s clothing. I’m also sure this list of non-toxic toy brands isn’t definitive! These are certainly some of the best I’ve come across though, but do let me know if you know of any more. 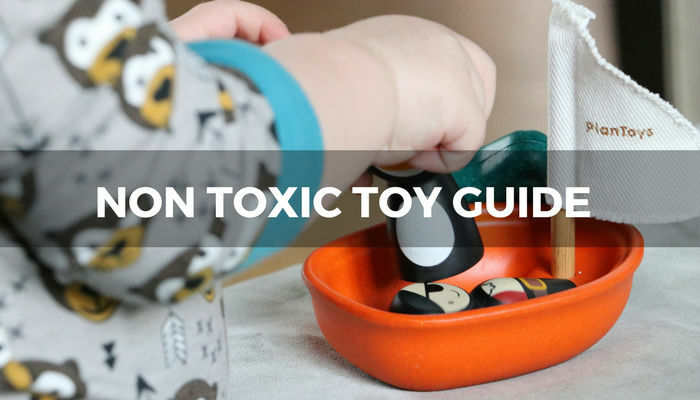 I hope you’ve found this guide to non-toxic toys helpful. As a Mum it’s really important to me to offer my daughter as healthy and natural environment as possible, in terms of toys, clothing, food and home environment. Whilst also not overthinking the whole shebang and worrying myself into a hole! At the end of the day, one of the best gifts we can give our child is an environment where they can freely explore their surroundings. It’s how they make sense of the world and it’s how they learn. Playing in dirt and exploring the world from a grubby floor is a natural part of this. But if you’re concerned by the level of chemicals that may be present in many of today’s manufactured toys and want to reduce the amount of man made chemicals and toxins your child is exposed to at an early age, investing in some non-toxic toy options is certainly a great step to take. You’ll also, of course, be helping the planet. 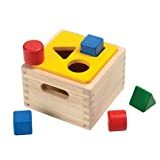 When my kids were babies, I used to buy them only wooden toys because they were non-toxic and also because they last longer than plastic toys. Now my sister has a cute little boy, and soon he is going to turn five years old. I will definitely buy him wooden toys too for his birthday. I really like the Camden Rose toys; I’ll take a look further on Amazon. Great to know all these important info! Wow- what an eye opening post you have written. I am embarrassed to say I have never given much thought to toxin in toys until now. You have outlined such a thorough break down of things to be aware of and considerations to make when purchasing toys and it is greatly appreciated. The recommendations and links you have provided are also extremely helpful for consideration. I love the idea of buying wooden toys because in addition to them being non toxic they often last a long time. I have many wooden toys still from my childhood that my children now play with. Again, thank you so much for your recommendations!